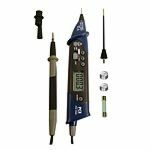 The PCE-PDM 1 Multimeter, which has a size and shape of a pen, is suitable for daily use. 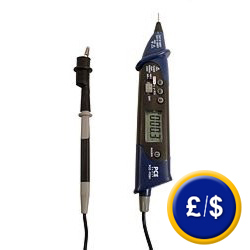 The multimeter comes with alligators clips and an extension for measurement points, allowing the multimeter to be used in places which are normally difficult to access. The ability to use it in one hand and the data hold function make this device easy to operate. All measurement ranges, such as voltage (AC/DC), resistance, diode test, continuity test can be operated by pressing a button which activates the controls within. Such properties are important for technicians working in the sector for installations and machinery. Here is an overview of our multimeters. PCE-PDM 1 Multimeter is measuring resistance. PCE-PDM 1 Multimeter is testing a fuse. The multimeter is a device for measuring electrical magnitudes which combines different modes and ranges in a single device. The standard equipment of a multimeter allows to measure voltage and intensity of current in different measurement ranges. 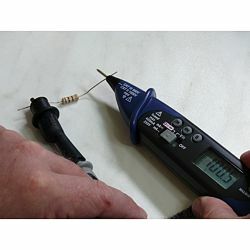 Normally the multimeter can be switched between measurements of voltage AC and DC. Other functions which form part of the basic functions of a multimeter are measuring resistance and continuity with an acoustic signal. 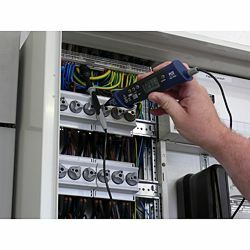 More equipped modern digital multimeters can also measure frequency, capacity and temperature. Analogue multimeters show the measurement value in different scales for different ranges of measurement. Values are displayed with discrete marks indicating the measurement value scale. To eliminate errors while reading results, high spec models come with a mirror and a scale that allows the value to be read with accuracy. The precision of high quality analogue devices can be as low as 1% of the indicated value. These instruments normally use a moving coil, whereas before they were electromagnetic devices with an actuating blade. Measurements of voltage and alternating current can, on occasion, lack accuracy and should have a rectifier preconnected for systems using a moving coil.